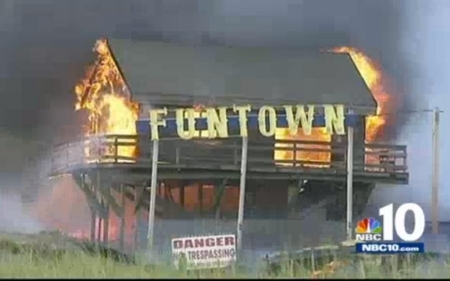 A six-alarm blaze is still burning in Seaside Heights, New Jersey at the the FunTown Amusement Pier as of 9:45pm. 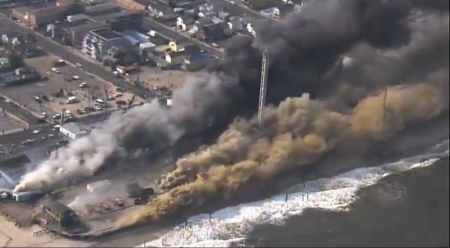 It started at around 2:15pm this afternoon near Kohr Brothers Frozen Custard shop, 1800 Boardwalk and quickly grew. The fire is giving off a large plume of smoke and embers. Strong winds are making it difficult to fight. 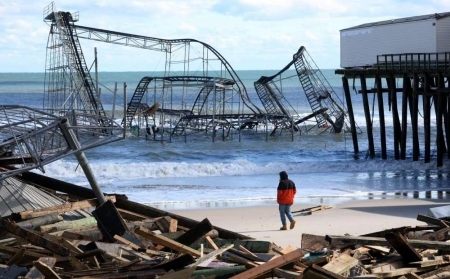 The pier was damaged last year in Hurricane Sandy and underwent repairs with FEMA aid. At this time the fire is still being fought though. Gov. Chris Christie gave a briefing at 7pm on the scene in Seaside Heights. He said that 35 engine companies, 15 ladder companies along with 400 firefighters were battling the fire. There were no reports of serious injuries, but a few firefighters were treated for smoke inhalation and heat exhaustion.